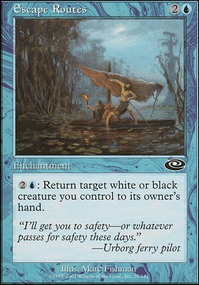 You need more lands, white does ramping poorly and you cant afford to miss a land drop ever, so probably 36 MINIMUM and 38 would be better. 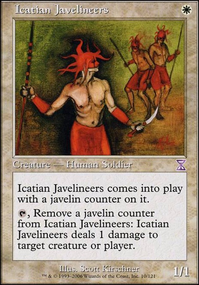 You need more ramp spells like Sol Ring , Thran Dynamo , Gilded Lotus , Knight of the White Orchid , Kor Cartographer , Solemn Simulacrum , Caged Sun , Gauntlet of Power and Extraplanar Lens . Also Herald of War is a very good choice as well. In short your playing big expensive creatures and you need the ability to get them out quickly. Note that the mana doublers I suggested works very well with your commanders mana sink ability. 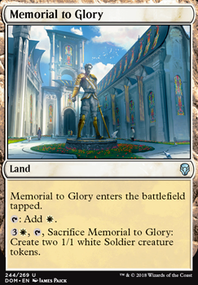 Oath of Lieges , Land Tax , Tithe , Kor Cartographer are all good white ramp cards. 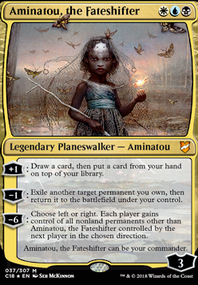 It's great to see someone playing Zedruu the political way she should be played while still going your very own, individual way :) I wish you great luck by trying out your deck in future games and hope my suggestions will serve you well ;) Otherwise... donate them! 1.) When I choose Zedruu, I choose to play a casual and social game. Stax and bad gifts does no good for this. 2.) I want to do something that is NOT the obvious route to take. 3.) New and/or unexperienced players have a hard time with stax and bad gifts. I love to try to 'play' the table in my favor and I gift them tokens in return. Eventually it should serve me way more than anyone else. 3.) 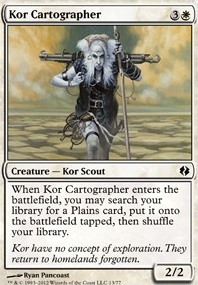 Creatures/permanents that fulfilled their role: Kor Cartographer , Mr. Sadface , even cards like Gift of Immortality . I am still balancing this act, so your suggestions are really appealing and I think I will give them both a try. Thanks! I will be coming to your deck soon. Might want to consider more early ramp. Mind Stone/Fellwar Stone/Wayfarer's Bauble and Knight of the White Orchid/Solemn Simulacrum/Kor Cartographer. Your curve is so beefy and I think more ramp will really smooth your play. You are in my realm this time with your flicker deck Wow that's a high curve. 17 of you flicker targets cost 5+ mana. Its ok to have big value cards, but when you have so many you aren't helping yourself. 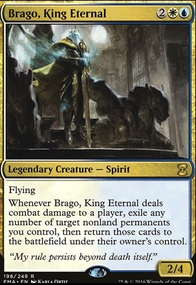 I'd also recommend running more protection for Brago so he can get in more. Off the top of my head I can only think of Whispersilk Cloak,Swiftfoot Boots,Lightning Greaves and Rogue's Passage. You have a bunch of mana doublers which is awesome, including the updated Regal Behemoth that's a mf dinosaur! Plus sorcery ramp. There's a decent spot removal package and some of the auto include boardwipes. A couple dinos have removal tacked on as well. Spellbreaker Behemoth is sweet. I love Samut and the haste enablers. Fervor is meh. You have a lot of really cool stuff here tho. You even snuck in Craterhoof & Avenger. There's a light token theme here which doesn't fit. Idk. The crossroads for me is the Gishath dino aggro or Zacama goodstuff combo. It'll be cool to ultimately see what your mind imagines!